Available in widths of 1/8", 3/16", 1/4" and lengths of 10', 25', 50', 100', & 500", SGT KNOTS Marine Grade Dacron Polyester Shock / Bungee Cord comes on a convenient spool, or cut to length coils for easy storage and use. Full sized and made in the USA, this bungee cord / shock cord from SGT KNOTS—proud to be a veteran-owned company—is 100% backed by the SGT KNOTS guarantee. SHOCK CORD - Top-quality, marine grade bungee cord with industrial level strength, stretch, and longevity. SGT KNOTS is the top choice for your rubber shock cord needs. DACRON POLYESTER - Our proprietary design and construction provide long-lasting resistance to all-weather environments and UV rays. The 1000 denier Dacron polyester shell covering repels water and defies abrasion even better than nylon. 100% STRETCH - Guaranteed to hold elasticity longer than other bungee ropes and shock cords on the market. First extruded latex rubber holds a consistent 100% stretch and high modulus. SIZE and COLOR - Bungee Cord length options: 10 feet, 25 feet, 50 feet, 100 feet, and 600 feet. Diameter thickness choices: 1/8 inch, 3/16 inch, or 1/4 inch. 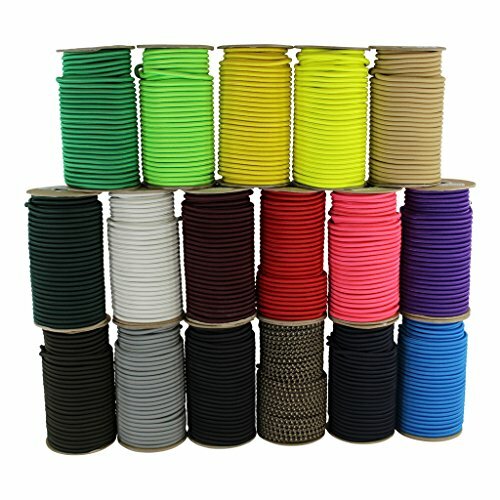 Our Elastic Cord is available in 20 colors: Black, Brown, Emerald Green, Hi-Visibility Orange, Kelly Green, Maroon, Midnight Blue, Neon Orange, Neon Green, Neon Yellow, OD Green, Pink, Purple, Red, Royal Blue, Silver, Tan, White, Woodland Camo, and Yellow. VETERAN OWNED and OPERATED - Marine Grade Shock Cord made in the USA. Just like the Marine Corps, SGT KNOTS is committed to being the best of the best. We continue to live by the motto, Semper Fidelis-Always Faithful. Our loyalty to our customers is what makes us who we are, and the reason we continue to grow in popularity and product offerings. We promise to maintain the strength and consistency of our products. We also pass down our bulk savings to our customers. If you have any questions about this product by SGT Knots, contact us by completing and submitting the form below. If you are looking for a specif part number, please include it with your message.